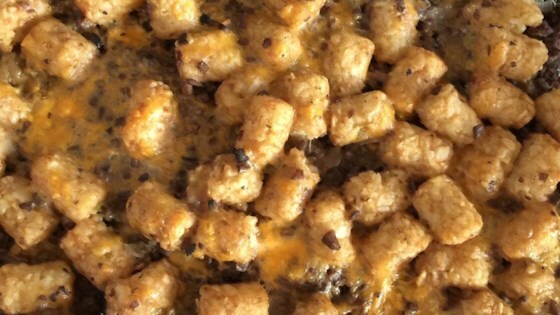 "Frozen Tater Tots®, Cheddar cheese, ground beef, and cream of mushroom soup combine for a comfort food classic in this recipe." Cook and stir ground beef, onion, garlic powder, salt, and black pepper in a skillet over medium heat until beef is browned and crumbly, 7 to 10 minutes. Spread beef into the bottom of the prepared baking dish. Stir cream of mushroom soup, potato nuggets, and Cheddar cheese together in a large bowl until potato nuggets are evenly coated in soup and cheese. Spread potato nugget mixture over beef mixture. Bake in the preheated oven until browned, about 45 minutes. Sprinkle paprika and parsley flakes over the top. An easy, cheesy casserole topped with buttery corn flakes and Parmesan cheese. I doubled the amount of tater tots and used two cans of mushroom soup. It is a quick and easy meal and my family loves it. I absolutely love this recipe, I use a small can of Campbell cheese soup with a can of cream of mushroom instead of the big can called for. This never lasts long.